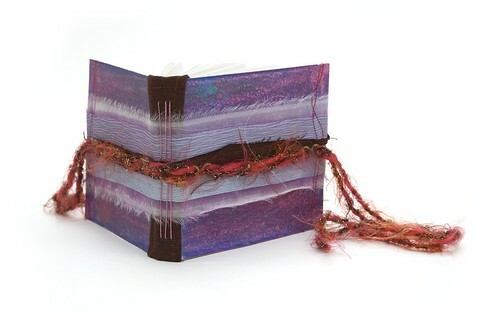 Purple Scrap Fabric Booklet, mixed-media 4 1/2″ x 4 1/2″ x 1/2″ ©2009 Leah Virsik. I’m working on updating my website. I’ve decided to use the Satorii theme. I’m hoping to make some minor changes with it. I think actually developing my own theme would be more work than I’d like to do at this point but I’m excited about the work I’m doing now. Egmont Van Dyck asked me to speak at the East Bay Artists Guild next year. Totally flattering! The same day Alyson B. Stanfield asked if she could could feature my art in her blog and someone called me about my class. I had to stop and think and realize that I’ve changed. I’ve created this world of creating art and teaching and it feels really amazing, like I’ve “made it”. I’m wanting to say that so when I look at other people “who’ve made it” I can be reminded that it’s a cycle, a process, a journey. It’s about “making it” everyday. Those wins along the way are really important to acknowledge. I got a subscription to Uppercase, something I’ve been wanting to do for awhile but when it came down to it I bought it because Geninne Zlatkis’ studio is featured. Very inspiring! ReadyMade magazine also came and I enjoyed the Denyse Schmidt article and her patchwork quilting. Oh, and her envelopes! I came home last night and made an envelope template inspired by this and this. I found a book on the Renaissance with great images that I’ve been making into envelopes and Tom brought me home some Japanese wrapping paper. Too fun! Cutting out paper is very satisfying! Congrats on all the great opportunities…how exciting! BTW, I received the lovely mail art you sent…so fantastic! I love your color combinations, they always go so well together – beautiful! Thanks so much Linda! So nice to connect with you through AEDM. I enjoyed seeing you grow this month.